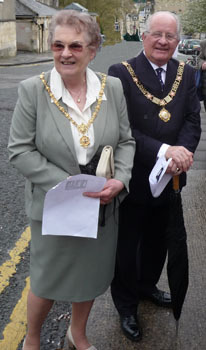 We were delighted to welcome the Mayor of Bath, Councillor Colin Barrett and his wife, the Mayoress. 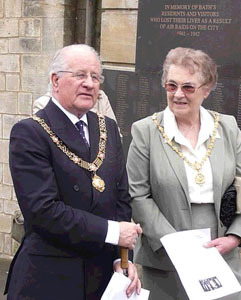 This was the first time that the Mayor of Bath had attended since 2003, when the Mayor of that year, Loraine Morgan-Brinkhurst had unveiled the memorial. The Bath Spa Band played while the Mayor was introduced to the participants and everyone took their positions. 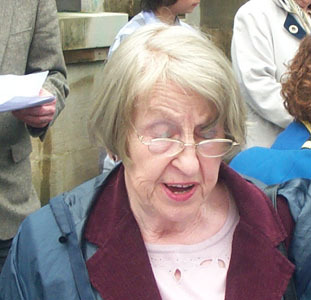 Ann Salter gave the introductory address, informing everyone that the theme of this year's service was the Manvers Street area with particular reference to St John's Church which was badly damaged in Bath's last air raid. Kay Barrett reads from "The Bombed City". 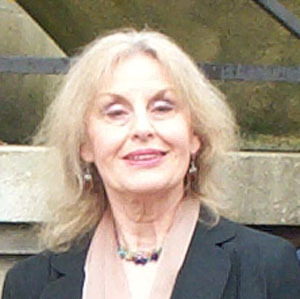 The extract read by Kay from The Bombed City, by Charles Whitby was specifically about the bombing of Bath. The poem is still in copyright however (it can be found in Bath In Quotes - ISBN 978-1-902733-09-8 - by Crucible Publishers) so the text cannot be reproduced here. Prayers for remembrance by Edgar Evans were followed by The Lord's Prayer recited by all. The Bath Spa Band played The Last Post. This was followed by 1 minute's silence for private contemplation. I can remember my father saying that if it wasn't for the wind blowing in the right direction that time, our house would have been hit, because we lived where my father had a business by the New Inn pub. He was a shoe repairer. I remember happy times around there. And I remember, my school, St John's in South Parade was also hit. There are two particular occasions stand out in my mind. When the aircraft were coming over and firing their tracer bullets, I always remember my mother saying to my father "Joe, come and have a look at these lovely pretty lights in the sky", and my father saying "Come in ..." No, I won't tell you what he said but he made her come indoors. On the other occasion, we used to have to walk to a tin chapel up on Claverton where the university is now. We used to have to walk up there at night to be safe. But I have happy memories of Bath, very happy memories, and thank you on behalf of the Mayoress and I, for inviting us here today. 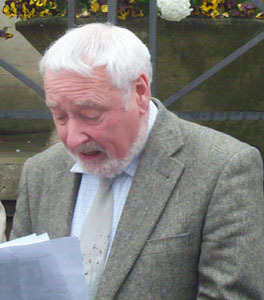 This was followed by John Penny, a local author and historian, reading extracts from two stories of St John's. Rather than reproduce the extracts, the full stories have been added to the website. The first was the memories of Canon Kelly. The second was the report of Swindon's Number 6 Rescue Squad, sent to Bath to assist after the third attack. Finally, it was remembered that Harry Patch had been in the Auxiliary Fire Service in 1942, and had fought fires on Bear Flat during the Bath blitz. 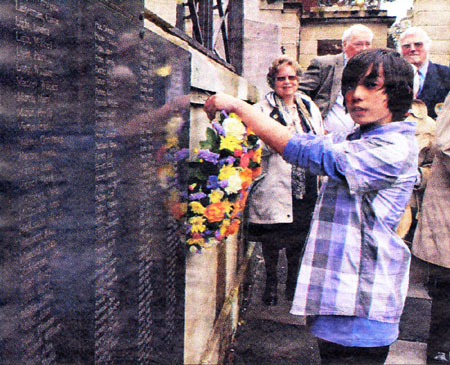 Laying the Wreath, by Ben Thomas. 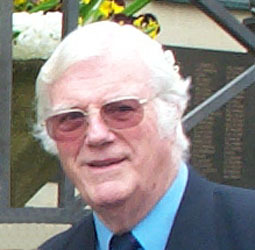 Father Timothy Sheridan was a Roman Catholic priest, and therefore could have no direct descendents, so Ben Thomas represented St John's Church, and laid the wreath in memory of those who lost their lives in the church when it was bombed, in particular, remembering Father Sheridan who was fire watching with Canon Kelly and was killed. During this part of the service, the Bath Spa Band played "Nimrod" by Elgar. 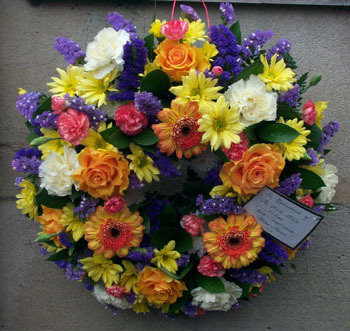 The Wreath, donated by Studio Flowers. Many thanks to Studio Flowers of 29 Charles Street for their kind donation. 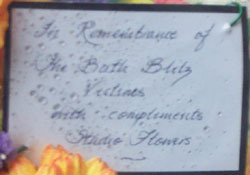 The message of remembrance on the wreath label was particularly appreciated. Ann Salter thanked everybody for attending, and reminded everybody that the next year's service would be on 17th April, at 3pm as usual. The Bath Spa Band played as everybody dispersed. Click here for information about the plans for the 2011 ceremony. The night when a Bath church was hit and its priest killed was remembered at an annual service in the city at the weekend. 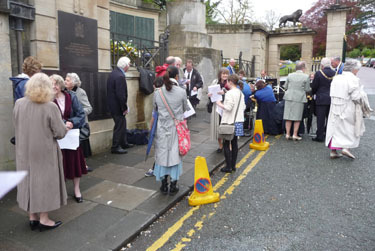 The Bath Blitz Memorial Project event concentrated on the stories of people who were in South Parade, Manvers Street and Newark Street during the Bath Blitz in April 1942. 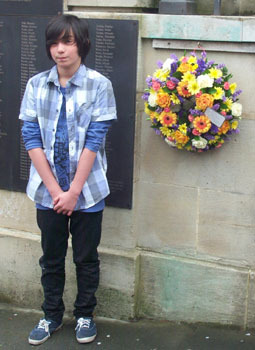 A wreath was laid at the city's main war memorial in Royal Victoria Park by 12-year-old Ben Thomas, representing St John's Catholic Church in South Parade. Among the 417 people who lost their lives during World War II in Bath was 35-year-old Father Timothy Sheridan, who had been in the presbytery of the church. A woman and her daughter sheltering in a basement kitchen were also killed. The church lost most of its roof but has since been restored. City mayor Councillor Cohn Barrett attended the service, where the Bath Spa Band played and passages describing the events of April 27, 1942, were read.